Date of birth unknown. Disciple of Onoe Ukon I, he received the name of Onoe Kojirô and performed in Kyôto as a wakashugata. He became wakaonnagata in the 1st lunar month of 1710, playing a keisei role in the new year ni-no-kawari "Keisei Shijûhachi Taka". He took the name of Onoe Samon in Kyôto in the 11th lunar month of 1716, playing the role of Princess Ono in the kaomise drama "Tatsu no Miyako Ikuyo no Yonedawara" which was produced by Yamatoyama Jinzaemon I. He went to Edo in Fall 1718 and played at the Ichimuraza in the 11th lunar month of 1718 the role of Kôbai in the kaomise drama "Gozen Nô Mitsu Uroko", sharing the stage with Ogawa Zengorô I, Sanjô Kantarô II, Ôtani Hiroji I, Ichimura Takenojô IV, Sodeoka Masanosuke II, Ôkuma Utaemon, Mimasuya Sukejûrô I, Nakajima Mihoemon I and Onogawa Orie. Samon's rank in the 1st lunar month of 1719 in the Edo hyôbanki, wakaonnagata section, was one black stroke below jô-jô-(hanshiro)kichi (superior - superior - almost excellent) rank [visual]. He played at the Ichimuraza the role of Manju (disguised as Soga Jûrô Sukenari) in the drama "Fukujukai Ômi Genji". His stage partner in the role of Kanju (disguised as Soga Gorô Tokimune) was Sanjô Kantarô II. Thanks to his performance in this new year drama, Samon's rank in the 3rd lunar month of 1719 in the Edo hyôbanki, reached the prestigious jô-jô-kichi level. He was also called Ômiya Yaemon ( ). He was the master of both Onoe Kikusaburô I and Onoe Kikugorô I. He went back to Kamigata the following year. He played in Kyôto in the 11thn lunar month of 1719 the role of the eye doctor Makino in the kaomise drama "Hôraisan Hiyoku no Tsurukame", which was produced by Yamatoyama Jinzaemon I for the nadai Ebisuya Kichirôbê. His rank in one 1720 Kyôto hyôbanki, wakaonnagata section, was jô-jô-kichi. 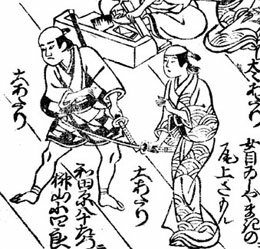 In another 1720 Kyôto hyôbanki, he was ranked one black stroke below jô-jô-(hanshiro)kichi (superior - superior - excellent) rank [visual]. No record afterwards. There will be in the future to come a full page dedicated to Onoe Samon in kabuki21.com. Date of birth unknown. He started his career as a disciple of Nakayama Shinkurô III, who gave him the name of Nakayama Isaku. He served his apprenticeship as a wakaonnagata, performing in Kyôto in miyaji shibai. He took the names of Nakayama Rakunosuke and Nakayama Toryû I at unknown date. He joined Onoe Kikugorô III in 1839 and received the name of Onoe Fujaku IV. Around that time, he also got married with the sister of Onoe Tamizô II, creating as a consequence a stronger bound to the Onoe clan. He went through several name changes: Onoe Toryû, Nakayama Shôraku and Nakayama Kiraku II in the 1st lunar month of 1844. He finally took the name of Onoe Shôju in the 8th lunar month of 1848 when he traveled to Nagoya with his master Ôkawa Hashizô I. He settled in this city where he became a local zagashira. He died in Nagoya in 1864. He was able to play a wide range of roles, not only as a tachiyaku, but also as a katakiyaku or an onnagata. He was said to be a very good fukeoyama during his latter years. Date of birth unknown. Disciple of Onoe Taganojô I, he received the name of Onoe Saijirô. He took the name of Onoe Sodenosuke in Kyôto in the 1st lunar month of 1701, performing in the new year ni-no-kawari drama "Keisei Sagano no Hara". He became wakashugata in 1702. Last-recorded performance in the 11th lunar month of 1717 in Kyôto, where he played the role of Rintarô in the kaomise drama "Genjôraku Biwa no Ôumi". 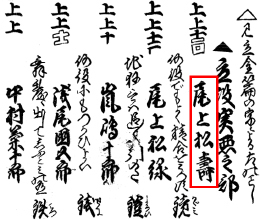 His rank in the 1718 Kyôto hyôbanki (1st lunar month of 1718), wakashugata section, was jô (superior) [visual]. No record afterwards. Date of birth unknown. 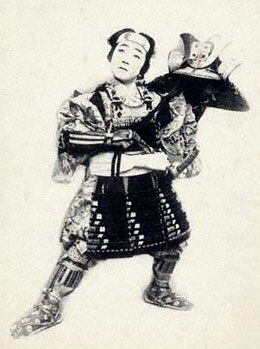 Youngest son of Onoe Baikô VI, he made his debut on stage in January 1914, performing koyaku roles under the name of Onoe Taijirô. He was a frail actor and he died the 2nd of September 1927 , 16 months after the death of his eldest brother Onoe Eizaburô VII. 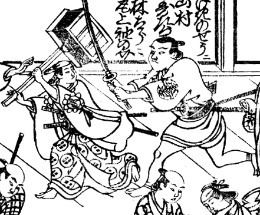 in Nojima Jusaburô's book "Kabuki Jinmei Jiten", Onoe Taijirô was reported as being the son of Onoe Eizaburô VII and the brother of Onoe Eizaburô VIII, with dates of birth and death similar to the ones of Onoe Eizaburô VIII. This was a huge mistake which should be corrected in the next edition of this important book.